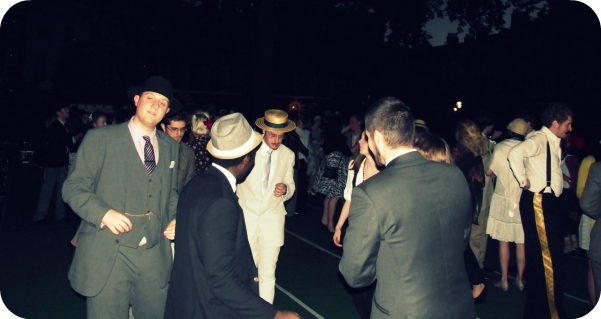 I have previously blogged about my last two visits to The Chap Olympiad, and also about my excitement for the third visit this year. The Olympiad is an annual event run by The Chap magazine, where ladies and gentlemen (of the very best kind) don their best frocks and compete in gentlemanly sports activities. Despite hours of praying to the rain gods, the weather was awful. The rain clouds weren't going anywhere, which made outfit choices very difficult. In the end I went for a vintage flowery skirt, purple petticoat, green top, and a cardigan. I decided to make myself look as summery as humanly possible by weather a collection of flowers on top of my head. I did chicken out of pretty shoes, and went with weather-appropriate boots. 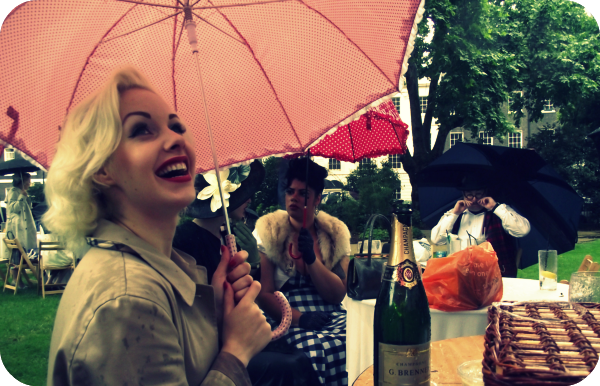 I arrived with Miss Banbury Cross, and we certainly were not impressed with the rain. She quickly attempted to rectify the situation with a bottle of champagne. It didn't stop the downpour but it certainly helped make us feel better. What was disappointing, was that The Chap organisers had done absolutely nothing to try and make the wet day better for us. The could have hired in some cheap gazebos, or sun parasols to keep the grass dry (as well as us). They could have removed the fabric tablecloths, which were just sodden, and they could have kept the chairs closed or covered so that we had dry seating. As you can see, Miss Betsy Rose did a darn fine job of remaining glamorous despite the lack of weather provisions (it wasn't even as if the rain was a surprise, we have had a week's notice via BBC weather). I felt a little let down to be honest, which is a shame, as I am such a massive promoter of the event - lots of my friends came the first time this year due to me harping on about it! So, a big thumbs down from me for the organisers lack of effort with a plan B. After a few hours of sitting in a downpour of rain, it dried up a little! We managed to get our wet coats off, and attempt to stary drying off. We were soaked through, and sick of holding up umbrellas. The rain wasn't over, but at least it managed to remain mostly dry. The great thing about the Olympiad, is that it brings together lots of online friends. Here I am meeting the lovely Shona from Heyday! clothing. She tried on Rockalily Hot Rod Red, and she looked awesome....a lady who knows her skin tone! With the power of alcohol, we managed to stay right till the end, and dance. We may have ended up slurring a little, but we had a blast. It was a shame that it was quieter due to the rain, and that we all got wet and a little miserable, but still wouldn't have missed it for the world!